“Margin trading theoretically gives speculators amplified gains, but trading in a bucket shop exposes traders to small market manipulations due to the shop’s agency. In a form of what is now considered illegal front running and self-dealing, a bucket shop holding a large position on a stock, and knowing a client’s vulnerable margin, might sell the stock on the real stock exchange, causing the price on the ticker tape to momentarily move down enough to exhaust the client’s margins. Through its opportunistic actions, the bucket shop thereby gains 100% of the client’s investment. There are exchanges currently that operate as modern day bucket shops. They offer an unsophisticated retail investor the opportunity to make short term bets on intraday price movements with significant leverage. The daily trading activity for these exotic instruments, namely the liquidations, can result in extreme price movements in the underlying price of the asset on other more regulated exchanges. We highlight this distinction not from any legal perspective. We’re not lawyers. But we are traders and risk managers. And we operate in a regulated environment so we have to follow the rules. We make decisions based on observable data and our understanding of market psychology. That being said, we are the first to admit that the market is still nascent and that market microstructure has a long way to go before being fully efficient. But we believe that a dynamic where side wagers on the price of a cryptocurrency become so large that they drive the actual price of the cryptocurrency will hinder this road to price discovery efficiency. We believe in speculation and we think sophisticated market participants should use leverage (we are traders after all), but we don’t believe it should exist like a bucket shop. Hopefully the derivative market evolves into something a bit more mature in the years ahead. One thing’s for sure. We aren’t the only ones that feel this way. Markets continue to react to any change in the likelihood of a bitcoin ETF approval by the SEC. 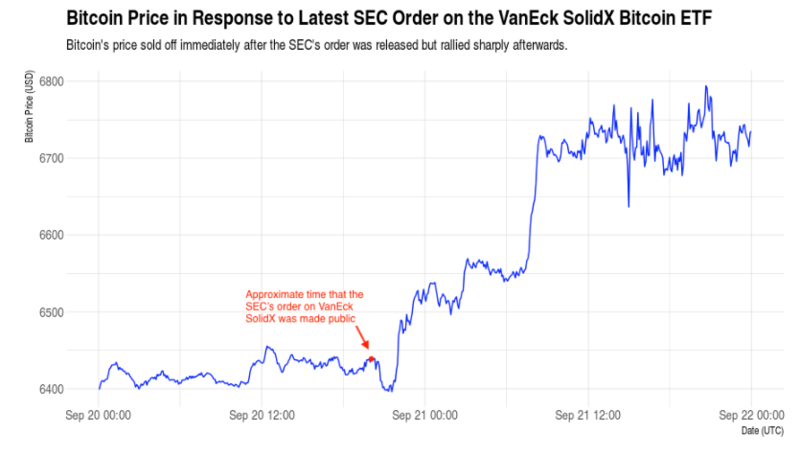 On September 20, the SEC issued an order that added a procedural delay to VanEck SolidX’s bitcoin ETF. Immediately after the SEC order was released to the public, bitcoin sold off by a small amount but rallied overnight as traders began to digest the news. What is the SEC’s process for approving an ETF? The ETF sponsor must first file for a “proposed rule change” with the SEC. Shortly thereafter, the SEC publishes the application in the Federal Register, the U.S. government’s official journal. This starts a countdown of 45 days for the SEC to act. At any time during these first 45 days, the SEC may extend the deadline by another 45 days if the SEC determines that a longer period is appropriate. During this initial 45 or 90 day window, the SEC will decide whether to issue an order that approves or disapproves the ETF or to institute proceedings to determine whether the ETF should be disapproved. If the SEC institutes proceedings, the deadline is extended to 180 days after the initial publication of the application. The SEC must issue an order of approval or disapproval before this deadline unless they elect to use their last extension of 60 days. Therefore, there are three key deadlines by which the SEC must issue an approval or disapproval order or use an extension: at 45 days, 90 days, and 180 days. If the SEC elects to use all their extensions, then the final deadline is 240 days after the initial publication of the application. Where is the VanEck SolidX ETF now? It was nearing the 90 day deadline and the SEC instituted proceedings to determine whether to approve or disapprove the ETF. This now puts the deadline at 180 days or on December 29, 2018. In all likelihood, the SEC will elect to use its last 60 day delay which means the final deadline will be at 240 days or on February 27, 2019. Why have we observed this market reaction in response to what should have been a widely expected procedural delay? One, the SEC has already rejected 10 bitcoin ETF proposals — in July the SEC rejected the appeal of the Winklevoss ETF which would have held physical bitcoin, and in August the SEC rejected a total of nine ETF proposals from ProShares, GraniteShares, and Direxion which would have held bitcoin futures contracts. The fact that the SEC has not come out with an outright rejection given their recent orders means that the possibility of an approval further down the line exists. Two, the SEC’s order to institute proceedings on the VanEck SolidX ETF could be interpreted as a new level of openness on behalf of the SEC due to the amount and type of questions that they have asked. Usually, when the SEC institutes proceedings, it seeks interested persons to provide comments on the application and to answer some specific questions that the SEC has on the application. In April 2018, GraniteShares ETF was going through the same process. In the order to institute proceedings on the GraniteShares ETF, the SEC asked a number of questions about the application — about 800 words worth. However, for VanEck SolidX, the SEC has asked interested persons to comment on about 2,000 words worth of questions. Of course, the number of questions that the SEC may ask is partially dependent on the specifics that are contained within each application, but the amount and type of questions that are asked could reflect a subtle shift in the SEC’s attitude. Moreover, the SEC is asking questions on topics that they have previously opined on, such as whether the Gemini Exchange is a market of significant size, even though in the Winklevoss order they had already stated that they do not consider Gemini to be one. How is the VanEck SolidX ETF different from previous bitcoin ETFs? The SEC’s position on the requirements needed for a bitcoin ETF are getting increasingly clear. The current best source of the SEC’s thinking can be found in the order disapproving the Winklevoss ETF. One option is for the ETF sponsor to demonstrate either that the underlying bitcoin markets are inherently resistant to manipulation or that the listing exchange has some other method of preventing fraud and manipulation. So far no applicant has sufficiently proved to the SEC that either of these things are true. The alternative option is for the listing exchange to enter into a surveillance-sharing agreement with a regulated market of significant size. Although previous listing exchanges have entered into surveillance-sharing agreements, the SEC has determined that all previous sponsors have not met this burden because the agreements are with exchanges are either not regulated or not of significant size. Of particular note is that in the SEC’s eyes, Gemini’s spot exchange market is neither a regulated market nor a market of significant size. And while the CBOE and CME’s bitcoin futures markets are regulated, they are not yet of significant size. VanEck SolidX is taking a slightly different approach than previous applicants. In fact, there are currently three classes of markets to get bitcoin exposure: the spot exchange market, the bitcoin derivatives market, and the OTC market. VanEck SolidX is striking the fund’s NAV to an bitcoin OTC index rather than a price set on the spot exchange or derivatives market. They argue that this approach mitigates any concerns of manipulation due to the nature of the bitcoin OTC market which involves principal-to-principal trading and the fact that the market participants are all well-established institutions that are regulated as broker-dealers. The exchange will also obtain information via the Intermarket Surveillance Group and other surveillance sharing agreements. This approach is sufficiently differentiated from previous applications, so it will be interesting to see the SEC’s response. The VanEck SolidX bitcoin ETF represents the last credible hope for a near-term approval of a bitcoin ETF because there are currently no other outstanding applications in the pipeline. And if this ETF is rejected, it could be one or two more years before another ETF is up for approval again given the current state of the underlying markets and the SEC’s thinking. The SEC commissioners are also currently reviewing the staff’s order to reject the nine futures-backed ETFs in August 2018, but there is no deadline on when the review will be complete. Our conclusion is that market participants should be open to the possibility that a bitcoin ETF will not be approved in the next one or two years. To the extent that some possibility of approval is priced in, the market could experience material weakness if a disapproval order is issued. This Commentary is for informational purposes and does not constitute investment advice, any type of recommendation or an offer to sell or a solicitation to purchase any securities from the Element Digital Funds or an entity organized, controlled, managed by or affiliated with Element Capital Group, LLC (“Element Group”). Any offer or solicitation may only be made pursuant to a confidential private offering memorandum which will only be provided to qualified offerees for careful review prior to making an investment decision.We aim to educate, report and/or opine on certain developments relating to the digital asset market. These are our subjective views,based on information and sources we believe to be reliable as of the date we publish, but we make no representations or warranties with respect to the accuracy, correctness or completeness of our opinions or any information herein and have no undertaking to update it. Please do not rely on it. Element Group and/or its affiliates and personnel have made investments in some of the assets or instruments discussed here, and may in the future make additional investments (long or short) in such assets or instruments without further notice.Element Group does not, here or anywhere, provide accounting, legal or tax advice, or make investment recommendations. Please do not rely on us for the foregoing. We strongly suggest that prospective investors seek independent advice with respect to any investment, financial, legal, tax, accounting or regulatory issues discussed herein. Certain information contained in this Commentary constitutes “forward-looking statements,” such as statements that include the words“may,” “will,” “should,” “expect,” “anticipate,” “target,” “project,” “estimate,” “intend,” “believe”. There are so many risks and uncertainties that actual events or results or the actual policies, procedures and processes of Element Group and the Element Digital Funds and the performance of the Element Digital Funds may differ materially from those reflected or contemplated in such forward-looking statements. Please do not rely on forward-looking statements. Past performance is not necessarily indicative of or a guarantee of future results. This Commentary is confidential, is intended only for the person to whom it has been provided, and under no circumstances maybe shown, copied, transmitted or otherwise given to any person other than the authorized recipient.